Distracted Driving Causes 8,000 Accidents Every Single Day! According to the AAA Foundation, distracted driving causes about 8,000 accidents every single day! And the CDC reports that more than 15 people are killed and 1,200 injured every day in those accidents. Corporate fleets are not immune from those numbers. You expect your employees to multi-task all the time, but never expect that while they are behind the wheel. Fleet drivers should have one goal and one goal only; operating their vehicle safely and efficiently from point A to point B. While driving, there should be no other tasks, no other distractions, nothing is more important. R&R Insurance offers Distracted Driving window clings to remind your drivers and others on the road to stop the distraction. Wisconsin businesses, if you would like a sample of our Distracted Driving window clings, use our convenient order form and we will send you a sample - or a few - depending on your needs. Fleet Safety Essentials – It’s About The Driver! 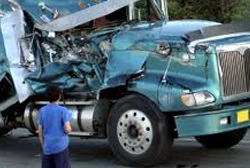 For more information about fleet safety and property casualty insurance, contact knowledgebroker Bill Katzfey.